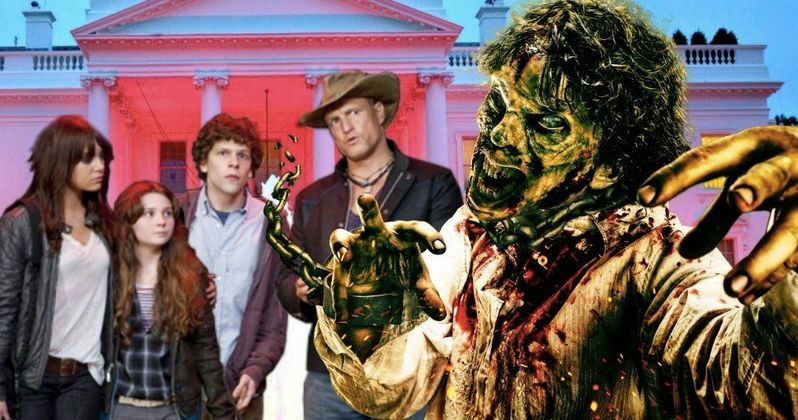 Zombieland 2 Leaked Plot Details Take the Zombie Hunters to the White House? Almost to the very day of the 10th anniversary of Zombieland, its official sequel will be premiering on the big screen. It's taken such a long time to get made due to all four of its leads taking on very busy schedules in Hollywood over the last decade. Now, the timing was right for Woody Harrelson, Abigail Breslin, Emma Stone, and Jesse Eisenberg to reunite for another stint in Zombieland. While we know Ruben Fleischer is also back to direct with original writers Rhett Reese and Paul Wernick penning the script, details on the sequel's story were kept private. According to new reports online, however, plot details have been leaked, revealing what viewers can expect when Zombieland 2 makes its way into theaters. If the rumors are true, the sequel establishes that the group of zombie slayers from the first movie have sinced holed up in the White House. Apparently, trouble in paradise leads to a nasty fight between Columbus and Wichita, fracturing the group. The drama leads to Little Rock embarking out on her own, fleeing with a man she just met named Berkeley (Avan Jogia). Of course, the others leave the White House and follow her once they realize she's gone, with the hopes of rebuilding their defacto family. On their new adventure, Tallahassee meets a female zombie-hunter named Nevada, who very much reminds him of himself. By remembering their important survival rules, the group must also be sure to watch out for themselves as they search Zombieland for Little Rock. The report also claims that the movie will introduce several new kinds of zombies, which have since mutated from the shamblers seen in the original. The dumb ones are called "Homers," the smart ones are called "Hawkings", and the silent, deadly ones are referred to as "Ninjas." Earlier reports have also suggested that Bill Murray will be playing himself in a new cameo appearance as well, this time bringing along Ghostbusters co-star Dan Aykroyd. It remains to be seen if Murray somehow survived what happened to him in the first Zombieland, or if he will now legitimately be a zombie when the group comes across him. As with the leaked plot details, however, these rumors have not been officially confirmed by the studio as of yet. Released in 2009, the original Zombieland remains one of the most popular zombie movies of all time. Partially a spoof of the genre, the movie was just as hilarious as it was bloody. Grossing over $102 million against a $23 million budget, Zombieland was very successful and helped bring zombies further into mainstream pop culture. The Walking Dead premiering on AMC just a year later would ride that momentum further to become one of the most successful television shows of all time. Zombieland 2 will be hitting theaters over nine seasons into The Walking Dead, and will have plenty of new material to satirize using the AMC show as source material. What we know for sure is that Zombieland 2 will be premiering in theaters on Oct. 11, 2019. More updates on the movie's progress should become available as production continues. Hopefully, we'll be seeing some teaser trailers or posters in the near future to start building anticipation for the long-awaited sequel. This information comes to us from Super Bro Movies.